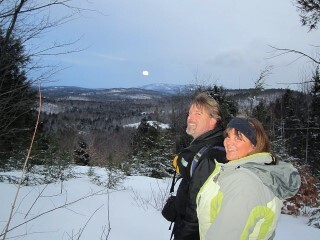 Take advantage of the increasingly longer days with Loon Echo Land Trust staff as they lead a Sunset-Moonrise Hike to Bald Pate Mountain on Saturday, March 31. This early evening meets at the Bald Pate Parking Lot on Route 107 in South Bridgton at 6 p.m. for the 45-minute scramble to the summit. March is also referred to as a Blue Moon. Along the way participants will learn about how Loon Echo and a group of concerned citizens rallied to permanently protect Bald Pate Mountain, the various critters that call it home, and what this special preserve’s future management looks like. Participants are encouraged to bring water, snacks and a headlamp for the return trip. Snowshoes or traction devices may be required depending on weather. Please check Loon Echo’s website and Facebook page for updates. Loon Echo's next event is Volunteer Trail Work Day at Pleasant Mountain on Saturday, April 14. For more information about upcoming events or ways you can support Loon Echo Land Trust, go to their website www.lelt.org or call 207-647-4352.